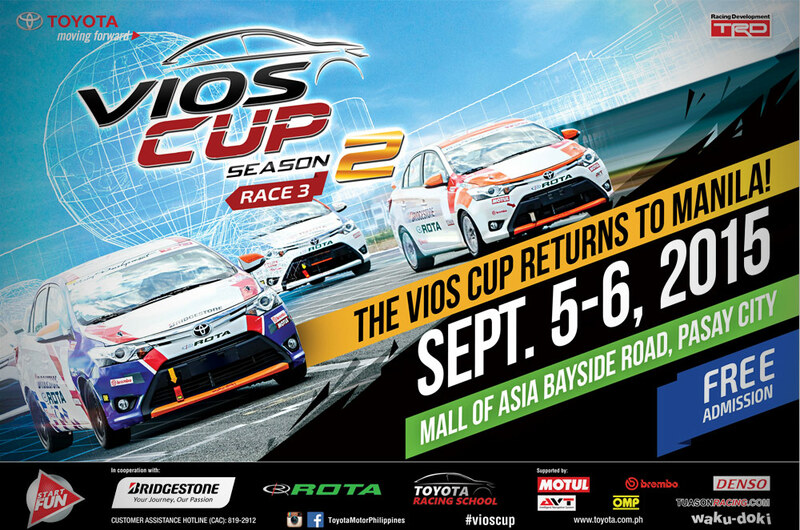 After a very long 4 month hiatus, Toyota Motor Philippines (TMP) is finally gearing up for the 3rd leg of the Vios Cup. And this time, they're heading to the SM Mall of Asia (SM MOA) to race in the Manila Bay Street Circuit on September 5/6. The organizers, however, are still hesitant to send us the official track layout. But early drawings show that it will be staged somewhere around the bayside area of shopping complex, near One Esplanade. It's also unknown how long the track will be, how many cars can race on it simultaneously, and if it'll run in a clockwise or anti-clockwise direction. What we do know though is that there will be 48 drivers from dealership teams and 8 celebrity racers who'll be going wheel-to-wheel on the race weekend. The list includes Jinno Rufino, Sam YG, Derek Ramsay, Jasmine Curtis-Smith, Joyce Pring, Kylie Padilla, Fabio Ide, and Phoemela Baranda. That brings up the total to 56, or 12 more than what they had at the SRP Cebu Street Circuit in May. Like before, they'll be separated into 3 race categories: Sporting Class, Promotional Class, and Celebrity Class. Aside from the main races, the weekend will also feature Food Trucks and Live Performances from various bands to keep all the guests entertained. As it stands, Toyota Alabang's Andres Calma currently leads the Sport Clas point standing with 100 points after dominating the 2nd leg. He's then followed by Daniel Miranda and Allan Uy in 2nd and 3rd, respectively. Meanwhile, Paolo Rodriguez of Toyota San Fernando (TSF) heads the points race in the Promotional Class, with Oscar Suarez and Arthur De Jong close behind. The 2015 Vios Cup is in partnership with Bridgestone and Rota, supported by Motul, TRD, Brembo, Denso, AVT, OMP, and Tuason Racing.